Partial proceeds from cocktail sales will go to the Dr. Peter AIDS Foundation. slice and 2 pineapple leaves. Blue Curaçao and fresh lemon. just the right amount of naughty. Grounds for Coffee - home of the world’s best cinnamon buns will be selling rainbow Pride Packs of cinnamon buns in support of the Dr. Peter AIDS Foundation! 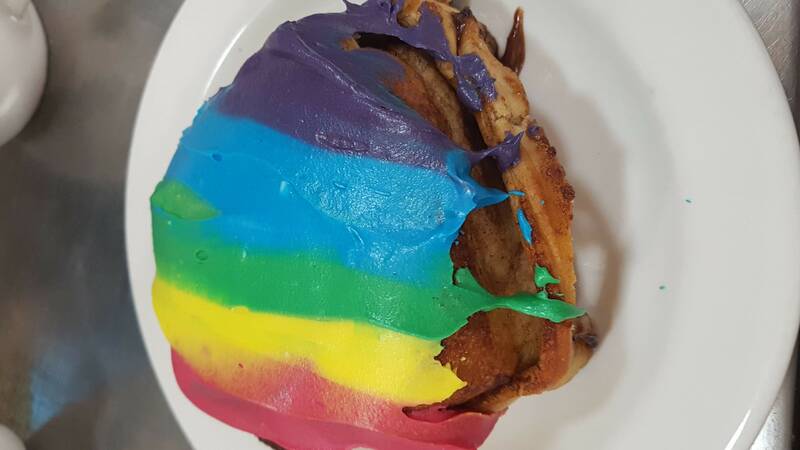 Each Pride Packs will sell for $18.00 (tax included) and contain six full-sized cinnamon buns, each iced in a unique and fabulous colour. All dyes are created using 100% natural extracts, with no artificial additives or colours. From August 3-5, 25% of sales from rainbow Pride packs will go to the Dr. Peter AIDS Foundation. You can participate in the AIDS Walk as an individual, start your own team, as a virtual WALKer, or by sponsoring a WALKer by donating to their personal fundraising page.